CNN camerawoman Margaret Moth survived a sniper's bullet in Sarajevo in 1992, but died of cancer on Sunday. (CNN) -- Each of us wanted to be one of the boys. 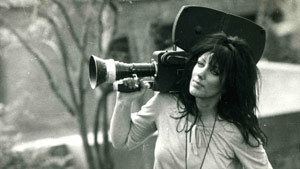 We all wanted to be cameramen, because in the early 80s, there were hardly any camerawomen covering international news. CNN, the then-unknown TV maverick, gave us a chance. We paid our dues and we worked hard. We kept turning up on all the big stories, on the front lines, in the midst of the disasters and revolutions, in the right place for the best shot. The cameramen made room for us, gave us the nod, and we became part of a club that is more like a family. At one point there were five camerawomen based internationally shooting for CNN. We were based at various times in Japan, Egypt, Italy, England, France, Lebanon, China, Cyprus, Turkey and South Africa. We worked with the best reporters on the biggest stories. We were pretty and fun and brave, and we came back with the goods. We were hard-core when it came to camerawork. We pushed the envelope, and we took shots that would take your breath away. We were all fiercely independent, much too independent to be united as a women's group. What united us was our passion for each picture, each story, our insatiable curiosity about new places, and as journalists, the feeling that we just had to be there. What did we learn? We learned that life is short and precious, we learned to be as respectful to the street sweeper as to the king or president, we learned that for all the intolerable cruelty that mankind is responsible for, there are also moments of incredible humanity and grace. And we learned that one powerful image can make a difference. Will we mourn Margaret Moth differently? Yes, in a few ways. This is one of those great wrongs that none of us could right. No single frame of video was powerful enough to change the outcome and keep Margaret alive, and that is utterly devastating. But we are also smiling as we think about birthdays in Somalia, sunrises in Iraq, mountain peaks in Tibet, floating down the Congo River and rollerblading down the Champs-Elysées. Our smiles celebrate the extraordinariness of our lives and the residue we carry, of at times sharing through the camera lens some of the most intimate moments in people's lives. Jane, Mary, Maria, Cynde and dear Margaret -- we broke news, we broke stereotypes, we broke hearts, and tonight I will drink to one of the girls.